It’s 4am and I am sitting on my mat as I do most mornings before my yoga practice; attempting to quiet the endless “to do” list in my mind. It’s the holiday season so those lists are longer and more involved than most months. I am thinking of gifts to buy, events to plan for my seniors, caroling to schedule with my children, decorations to hang and on and on. I take a deep breath and realize that the only hope I have to calm my mind is to begin moving through my Hatha practice. I have been teaching yoga for eighteen years in Los Angeles, Montana and here in Columbus. I have worked with a wide variety of clientele. In Los Angeles, I worked with the LA Unified School District in developing “Yoga on the Spectrum” for children in the classroom with autism. We used simple breathing and easy poses to de-escalate difficult behaviors and frustration. I worked with women in pregnancy, people with cerebral palsy, children and our elder population. 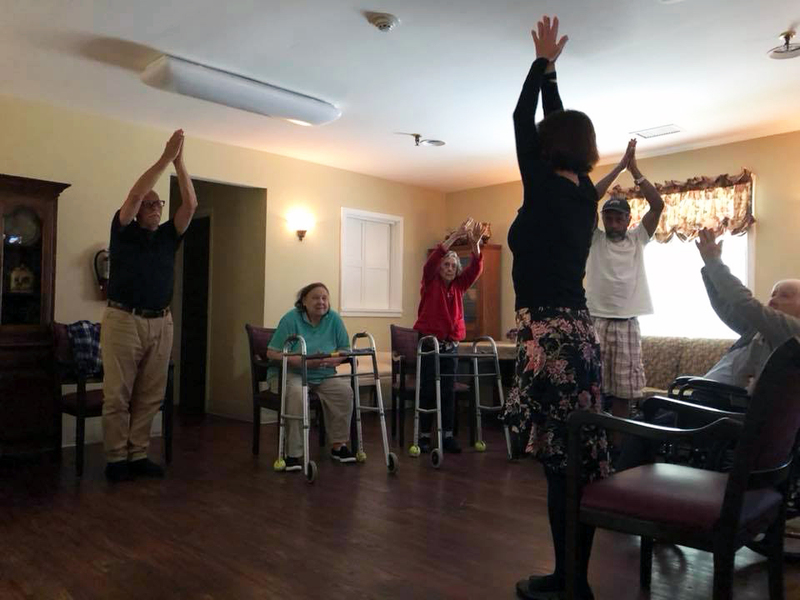 Yoga at Arlington Court has become a regular practice for our seniors as a way to relax and connect. Our yogis have begun to look forward to our classes and are starting to see the benefits. For our residents who walk with assistance or independently, we modify standing poses to increase balance. Simply standing in tree pose or shifting weight from foot to foot can increase balance in our residents. We can even use the wall or a chair for further support. We use pranayama (breathing techniques) during our practice. There are many different ways to use our breathing to connect, calm our minds when nervous or invigorate ourselves when energy is low. Our residents are beginning to use some of this pranayama between classes to help feel better through the week. Many yoga poses use the practitioner’s own body weight to increase and maintain muscle. For residents seated in wheelchairs, the chair itself can be used for resistance. Yoga incorporates gentle stretching to maintain elasticity in the skin and flexibility in the joints. Our residents with arthritis are feeling the benefits of gaining flexibility and range of motion through yoga. Proprioception is the sense of the relative position of one’s body and the effort being employed in movement. Proprioceptors are located in tendons and striated muscle. The signals are then processed in the vestibular system of the brain. Yoga stimulates proprioception by coordinating poses (asanas) and breath (pranayama). The overall effect of yoga increases body awareness and a mind-body connection. Residents with Parkinson’s or other neurological disorders can begin to use yoga to gain awareness and body control. 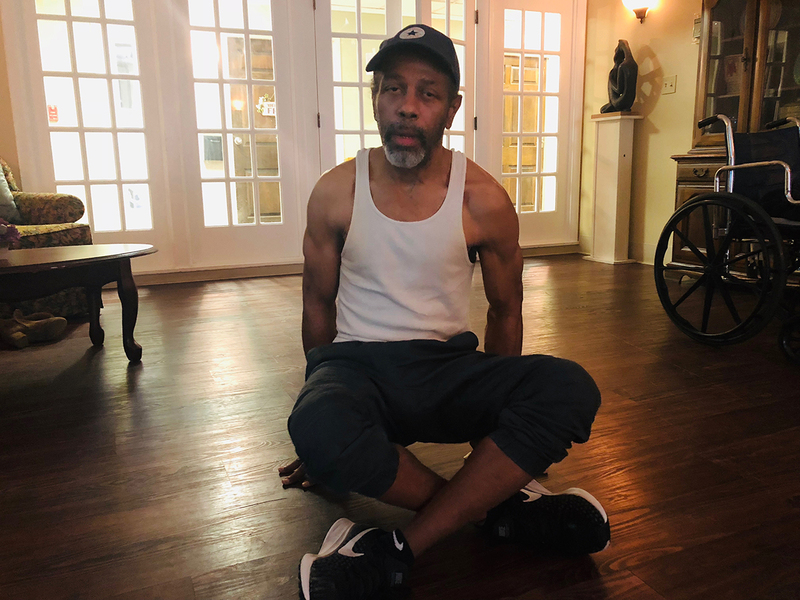 We are seeing residents utilize yogic techniques to gain a sense of control during tremors. Yoga is new to most of our elder population in the United States. It’s very rewarding to see our residents at Arlington Court immersing themselves in an entirely new activity. They have come to look forward to our classes and even ask for tips to practice on their own. Their willingness to jump-in to something new is truly an inspiration. When I find myself struggling to commit to my personal practice, I think of our residents at Arlington Court. I think of the physical and cognitive barriers they face in their yoga practice. I think of their excitement about learning these techniques that are so new and foreign to them. I see how for them, life continues to be a process of growing and learning… It humbles me. And it makes me beyond grateful to have these elders in my life.